Fly in the Dragon Rapide, wing to wing with the iconic Spitfire - one of the most famous aircraft in the world, this is a Squadron Leader Package. 3 hours, with 30 minutes in the air. Fly in the Dragon Rapide, wing to wing with the iconic Spitfire - one of the most famous aircraft in the world, this is a Wing Commander Package. 4 hours, with 30 minutes in the air. 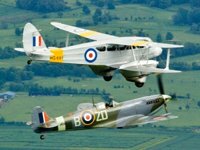 Fly in the Dragon Rapide and the Tiger Moth, wing to wing with the iconic Spitfire - one of the most famous aircraft in the world, this is a Air Commodore Package. 1 day, with 1 hour in the air.